In the first reading we heard God was going to put on a pretty good spread, the best of everything, a huge banquet of food and drink. That feast points to what God has prepared for us when we get to heaven. The Gospel is similar, but not the same. The Gospel is about the sheer abundance that God provides – about how God gives way more than we could ever expect or imagine. The difference between the feast you will have tonight and the one in heaven, is that tonight’s dinner will come to an end. In heaven you will never lack anything, and your happiness will never end. Its important to enjoy yourselves and have a good time tonight. But it is also incredibly important that you keep coming back to Church to celebrate and taste of God’s heavenly banquet. What happens during the Mass or Eucharist, is a foretaste of heaven as Jesus himself turns the bread and wine into his Body and Blood. The blessings here are more abundant than you could ever imagine. By coming here, you will receive the spiritual food you need to get to the everlasting banquet God has prepared for us in the future. As you leave St Joseph’s, realise you are not leaving the parish community. As you leave St Joseph’s, I pray for you that you may get your priorities right, that you place God first in your life. If you do, every blessing will be given you in a measure you could never imagine. Eucharist means, thanksgiving. 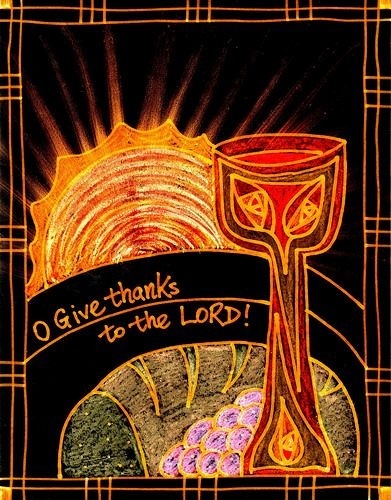 As we now celebrate the Eucharist let us give thanks to our heavenly Father by offering our lives to him, just as Jesus offered himself to the Father as a living Sacrifice.